The most relevant reason a Master Mason should advance beyond the third degree is to complete his Masonic education. The Symbolic Lodge, as existing in this country today, uses only part of what was originally considered the complete teachings of the Lodge. On your journey through the three degrees of Symbolic Masonry and as you have learned the proficiency lecture for each degree, no doubt many questions have arisen concerning the meaning of the ritualistic ceremonies, the historical implications and the ‘why’ of the legends of Freemasonry. As a Master Mason, you will recall that certain things were left undiscovered as you made your travels in and around the Temple of Solomon. The York Rite is the only way of discovering that which was lost, and reveals to the candidate, in a most impressive manner, the true nature of his duties toward God, his neighbor and himself. The companionship and camaraderie which are established in the local Symbolic Lodge, are further strengthened and enriched by the additional light exposed to each member of the York Rite. Although many erudite brethren have delved into the history and mysteries of Freemasonry no one has as yet determined the exact time the fraternity originated or where it first came into being. For example, in England the Grand Master of the Grand Lodge is also called the head of the Grand Chapter of Royal Arch Masons. In many jurisdictions some of the degrees here conferred by the appendant bodies are conferred by the Symbolic Lodge. On the North American Continent the appendant system or rite referred to as the York Rite includes some additional degrees supplementing the work of the Lodge. These are the degrees conferred by the Chapter of Royal Arch Masons, the Council of Cryptic Masons, and the Commandery of Knights Templar. The York Rite consists of the Symbolic Lodge, which is of York origin; the Chapter of Royal Arch Masons; the Council of Cryptic Masons; and the Commandery of Knights Temple. The Lodge teaches of the LOST WORD, the Chapter teaches of the DISCOVERY of the WORD, the Council teaches of the PRESERVATION of the WORD, and the COMMANDERY binds the Christian virtues of their promise of immortality in the expanding story, thus rounding out the STORY of the WORD. It is also said that the Lodge symbolically deals with the material side of life. The Chapter and particularly the Royal Arch Degree, deals with the spiritual side of life. The Council deals with the philosophy of life and death, and the Commandery adds the Christain interpretation to the symbols of Ancient Craft Masonry. 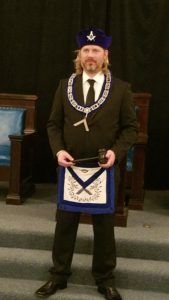 The York Rite of Freemasonry as practiced in Illinois, consists of four degrees of Capitular Masonry, conferred in a Chapter of Royal Arch Masons; three degrees of Cryptic Masonry, conferred in a Council of Cryptic Masons; and three Orders of Chivalric Masonry, conferred in a Commandery of Knights Templar. Minor differences in structure may occur in jurisdictions outside of Illinois. Regardless of the specific form, the degree work is dignified, impressive and inspirational, and is designed to reinforce and expand upon the moral precepts taught in the three degrees of the Symbolic Lodge. The York Rite is a neighborhood-type of Masonry. As York Rite Bodies are housed in local Masonic Temples, these bodies help to support our Temples with rental payments for the meetings of the Symbolic Lodge, the Order of DeMolay, the International Order of Jobs’ Daughters, Order of Rainbow for girls, Knight Masons, York Rite College as well as many other Masonic orders. Degrees are typically conferred at the local Chapter, Council or Commandery over the course of several weeks or months. Degrees may also be conferred at a “festival”, wherein the candidate is a member of a class which witnesses the various degrees as they are performed, typically all in one day. While this manner may be preferred by some whose schedules do not allow sufficient time to receive the degrees in a “normal” fashion, most recommend individual participation to provide for a much richer experience, and the chance to meet and greet the other members of the local bodies and thereby establish friendships and share common experiences. Who and What are the Royal Arch Masons? Mark Master, Past Master, and Most Excellent Master. All are beautiful, interesting, and teach valuable lessons, but the Most Sublime Degree of the Royal Arch is more important than all that precede it. It brings to light many essentials of the Craft contained only in this Most Sublime Degree & explains many Cryptic passages of the first three degrees incomprehensible to the Master Mason. Without a knowledge of these , the Masonic character cannot be complete. It has been said that “the Royal Arch stands as the rainbow of promise of the resurrection; of that which was lost and that which shall be recovered.” The value of Royal Arch Masonry will be justly appreciated by all who are exalted to the Most Sublime Degree, particularly by those who are seeking to complete their Masonic education. It reveals the full light of Ancient Craft Masonry, presents it as a complete system in accordance with the original plan, and confers at last the rights & light of a Master Mason, in fact as well as in name. It truly leads to a fuller understanding of the purposes and spirit of Freemasonry. For the first time the Master Mason can perceive the completeness of the Ancient Craft & understand how all its forms & ceremonies are the preparation for the final goal, the Most Sublime Degree of the Royal Arch Mason. The Past Master degree came into being because originally the degree of Royal Arch was conferred by the Symbolic Lodge only on actual Past Masters. This restriction prevented many worthy brethren from receiving the full information of the degrees of Freemasonry. The degree of Past Master was instituted in order to conform to tradition and to make it possible for worthy brethren to receive the Royal Arch degree. The conferring of this degree by a Chapter gives a brother no rights as a Past Master in a Symbolic Lodge unless he has actually served as Master of his Lodge. The Most Excellent Master degree dramatizes the historical incidents of the completion and dedication of King Solomon’s Temple. This degree emphasizes the opportunity and obligation of Companions to disseminate light and knowledge to less informed brethren. The Royal Arch Degree is set in a later period in the history of the Jewish People. Events of the objects of the Jewish people were preserved, discovered and restored. This degree is the culmination of Ancient Craft Masonry for here we find that which was lost-the word for which you were given a substitute in the Master Mason degree is imparted to you in solemn and impressive ceremonies. With the recovery of that which was lost, it would seem to the novitiate that his search for light was ended. However, in order that he might better acquire the lessons, a seemingly inverse movement of the Degrees, historically, is set up. The Royal Arch degree is not native to Scotland, but seems to have been introduced from both Irish and English sources, often Military Lodges, towards the middle of the eighteenth century. The first confirmed reference to a Royal Arch ceremony in a Scottish Lodge is contained within the Minutes of Lodge St. Andrew in Boston Massachusettes which is dated 1753. Military Lodges introduced many other degrees beyond the Craft, and when the regiments moved on, Lodges in the vicinity sometimes continued to work them. This situation continued until the end of the eighteenth century. Who and What are the Cryptic Masons? The degrees of the Council of Royal and Select Masters are necessary to fully complete your education in Ancient Craft Masonry. The degrees of our Masonic system are not chronologically arranged and in the degrees of Royal and Select Master, which many believe are the most beautiful and impressive of all, you learn of additional incidents in the building of the first temple. During these degrees you represent the Master Builder, Hiram Abiff, and learn why the word was lost and the secret of its preservation and recovery. The Super Excellent Master degree, though having no connection with Ancient Craft Masonry, is a vivid dramatization of truth and fidelity and never fails to impress those who witness it, either for the first time or after many times. The degrees of the Council will enable you to more fully understand your third degree of Symbolic Masonry and the degree of Royal Arch. This is the first degree of the Cryptic Rite as conferred in the United States of America. Candidates who receive the degree are impressed with its dignified ritual and relevant teachings. It contains one section which is generally regarded as an outstanding display of symbolism and content of philosophy. The ritualistic presentations in the degree explain the articles contained in the Holy of Holies of King Solomon’s Temple, including the Ark of the Covenant. A knowledge of which is essential to those who would fully understand the preceding degrees. The principal characters in the degree are Solomon and his royal assistants. The degree of Select Master has not always been associated with that of Royal Master. Jeremy Cross, a traveling Masonic lecturer, author, and educator of the early 1800’s, is given credit by most writers for having combined the two degrees into one rite. There is strong evidence to support the theory that the degree came from a similar degree of the Scottish Rite called Intimate Secretary of Grand Tiler of King Solomon. Regardless of its origin the legend of this degree is old. The scene of this degree is laid in the underground vault of King Solomon’s Temple. The events which characterize the degree are stirring enough to make it one of intense interest. The ritualistic presentations contain the story to “complete the Circle of Perfection” in Ancient Craft Masonry. As we have stated, the degree of Super Excellent Master is not a degree of the Crypt. But, it relates events that lead to the recovery of the lost Word. This degree beautifully tells of a period of history in which all Freemasons are interested, that period following the destruction of the first Temple. The essence of the degree is foretold in the presentation by the Principal Sojourner in the Royal Arch Degree when he makes reference “Zedekiah was one and twenty year old when he began to reign and he reigned for eleven years in Jerusalem, and he did that which as evil in the sight of the Lord his God,” etc. The degree of Super Excellent Master is one of the best devised, most impressive, and beautiful degrees. It is most enlightening and relevant to one’s daily life. In a display of exciting events, Biblical characters come to life exemplifying the historical drama of the Holy Bible. Here Nebuchadnezzar rules again; Zedekiah proves the results of his wicked life; Ezekiel and Jeremiah prophesy the promises of Almighty God. The Cryptic Rite is widespread, although governing bodies exist only in England, Scotland, Canada, and the United States. In England the Cryptic Degrees are controlled by a Grand Council of the Cryptic Degrees. In Scotland, the Supreme Grand Royal Arch Chapter has jurisdiction over the Cryptic degrees, the Royal Ark Mariner degree, the Knight of the East, and Knight of the East and West; bodies of the Cryptic Rite are attached to Chapters. It is interesting to note that while Scotland received the first three degrees of the last series from American sources, the degree of Thrice Illustrious Master, taken over recently in this country, as of Scottish origin. Freemasonry seeks to improve the community by improving the individual. Therefore, Councils of Cryptic Masons are found working with Lodges, Chapters, and Commanderies giving more opportunities to improve one’s skills in leadership, public speaking, interpersonal relationships, and administration. This empowers Masons to become better leaders in their career, church, and community. Councils also work with these and other Masonic groups in community service projects to demonstrate Masonic teachings as a way of life. A Commandery of Knights Templar in the United States confers three Orders. The Illustrious Order of the Red Cross, The Order of Malta, and the Order of the Temple. The Masonic Orders of the Temple and Malta are founded upon the traditions of the Chivalric Orders of Knighthood of the middle ages, and the rite has therefore acquired the title of Chivalric Masonry. The Commandery of Knights Templar is founded upon the Christian Religion and the practice of the Christian virtues. The Orders of Malta and the Temple are entirely based upon the ethical, moral, and spiritual concepts for a well governed life. In the early history of the Rite, these Orders were classed as “degrees.” While they are conferred as “Orders” today, they are degrees, or steps in Chivalric Masonry. The Knights Templar provide a path for those who wish to continue the growth of character, morality and brotherly love through Freemasonry. Building on what is taught in Lodge , the modern Knights Templar add the lessons of Christian brotherhood and devotion to duty that so marked the ancient Templars. The modern Templar is a Knight in every sense, as were his ancient brothers. Steeped in the sprint of chivalry, he is devoted to honor in all things, abhorring cruelty, deceit and cowardice. Devoted to duty to his order and his country, he is a leader in protecting the rights of others especially those who cannot protect themselves. original order in Jerusalem near the end of the First Crusade. Today, that spirit lives on. of the order and the World. The first Order conferred by the Commandery is the Illustrious Order of the Red Cross. The theme upon which this order is based has quasibiblical roots, for it is based upon an account found in the book of II Esdras in the Apocrapha and in the writings of Josephus. It teaches reliance upon the inherent valves of reverence for Diety, Truth, Justice, and Liberty, with emphasis upon the importance of Truth. A Commandery of Knights Templar will open a “Council of the Illustrious Order of the Red Cross.” and create the candidates “Companions” of that order. The ritual of the Order of Malta is purely Christian and, when conferred in full form, is one of the most striking and impressive of the degrees in the York Rite system. Shifting to the time of the Crusades, admission to the Mediterranean Pass is sought so that a safe pilgrimage to the Holy Sepulchre might be undertaken. This is a sublime and sacred Order, which culminates in the enrollment of the suppliant as a Knight of Malta. The Third, and last, Order conferred by a Commandery of Knights Templar is “The Order of the Temple.” This is considered to be the most impressive and inspiring degree to be found in any Masonic system. The moral and spiritual lessons of Christianity that are communicated in the work leave a lasting impression upon the candidate. It is very important that every Christian Mason complete his Masonic education with this valiant and magnanimous Order, thereby equipping himself to advance the programs and teachings of Christian Masonry. Some of us have traveled the road of York Rite Masonry to go from Blue Lodge Masonry to the Shrine. Some have joined Blue Lodge and remained there to work and make their mark. Others have gone on to Royal Arch or Council or Commandery and remained there to work. Some, a select few, have stopped along the way to work in the various branches of York Rite Masonry and have earned the title of KYCH, Knight York Cross of Honor and perhaps have achieved the Order of the Purple Cross awarded by the York Rite Sovereign College of North America. Some also have gone into the Shrine to mark their outstanding marks in Masonry. Regardless of where we toil in the vineyards of Masonry, we must remember that WE ARE ALL MASTER MASONS, that we all knelt at the same altar, and that we all took the same obligation: to promote the principle tenet of Masonry: BROTHERLY LOVE, RELIEF, and TRUTH. I am certain that we all have the same desire to be serviceable to our fellow creatures. Some of the bridges over which we have passed are worn and in need of repair. We must go back to shore up the foundations, to strengthen the weakened handrails, and to replace the worn planks over which future generations of Masons travel. We must remember that we too will travel that same road on our return. We must all renew our commitment to Masonry to insure that this Fraternity, which has been temporarily placed in our custody, will be strong and healthy when passed on to those who follow. Freemasonry represents the country, home, and the public school, stands for the Law, order and decency, for honor, morality and religion, for fraternal love, brotherhood among men, the relief and the truth. While Freemasonry in its present form has existed less than 300 years, there have always been associations resembling this great Fraternity. Such groups were formed at various times and in many places because man is fundamentally a social creature, he has an inherent need for friendship, love, and association with others. Freemasonry is a Story of Life, with all its joys, its heartaches, its failures and its final triumph over all earthly things. Freemasonry is an organization of men believing in the Fatherhood of God and the Brotherhood of Man, using builders tools as symbols to teach basic moral truths, thereby impressing upon the minds of its members the cardinal virtues of Brotherly Love, Relief and Truth which they should apply to everyday activities. If this description seems out of place in the cynical world of today, let us remember that “Man does not live by bread alone”. There is a real need for what is derisively called “the old-fashioned virtues”. “Freemasonry is an ideal way of life”. Freemasonry has more to offer the third millennium than the third millennium has to offer Freemasonry. With all the progress in science and technology now days offered to humanity, man has not kept up his moral advancement. In spite of all the comforts afforded us in this modern world, we do not find happiness, peace, and tranquillity. If we look around us today, we can find frustrated individuals, unhappy people, everyone demanding more “rights”, everyone seeking more “security”, an increase in community problems, and undeclared wars in many places. Freemasonry does not concern itself with the dogmas, forms of worship, or the theology of any church. A Mason must profess a belief in God and immortality, but Freemasonry does not teach him how God manifests himself to man or how man is reconciled with God. Thus, freemasonry offers tolerance for the religious beliefs of all men, to the point that they can meet together and pray together in complete harmony. Freemasonry offers the world a philosophy of life. The Masonic degrees are designed to teach each member certain truths No man ever became a Mason without becoming a better man. Freemasonry inspires men to thought and meditation. Freemasonry needs men who would like to do something and not to be somebody. We want men who are Masons in word and deed and not simply joiners. Freemasonry is not practiced in the dark, neither are its teachings the dogma of some forbidden cult. No other fraternity offers such profound lessons in its Ritual or work, as does Freemasonry. To the question of some people as to why do the lessons of Masonry are taught under closed doors if said teachings are so good, the answer rests upon the nature of men. Everything that is open to the sight of everybody turns out to be common and does not attract attention. All that is hidden is looked for, it is attractive and creates interest. The element of anticipating what could happen, an air of mystery, to feel that a possible surprise is coming. All this puts the mind of the new affiliate in a receptive state. We can add that all the lessons are taught with symbols. This is an old and effective method of teaching and permits the student to learn easily. A moral teaching can be said with a few words describing the symbol. These lessons can be taught without any reference to sectarian creeds or dogmas. None of these organizations is exactly equal to this great organization which the world recognizes as Freemasonry. There must be something good and great in Freemasonry, for it to stand through the years as a beacon of light to its members and as a symbol of the true way of life for all to see and follow. Its greatness is not due to its secret teachings, its mysteries or fanfare of its deeds, but rather to the profound lessons taught to its members and to the comfort, inspiration and enlightenment brought to all that will but study it. One peculiarity about Freemasonry is that it will stand investigation. The deeper the research, the more extensive the knowledge of its hidden art and mysteries, the more highly it is appreciated. Some people could ask, What could Masonry offer the youth and good men of the world? There are several compromises as that of to go on our way to serve a worthy brother. To look over our brother; to always keep absolute discretion; to help a brother and protect his good name; to warn a worthy brother of imminent danger; to offer our brother a friendly hand, listen to him and comprehend him when he needs it. To make him a favor or provide him with a word of encouragement when he needs it; the compromise of being always willing to help another Mason or his family in the same way that we could do it with a carnal brother. We offer all these securities to the youth and good men who are willing to reciprocate. It is taught by precept, allegory and symbols the virtues of fidelity, temperance, force, prudence and justice; all of them true in our days, true in the past and true in the future. We are in the best disposition to share the legends, the allegories and the symbols illustrating said virtues with young men who are willing to compromise to the virtues that these legends, allegories and symbols represent. Freemasonry offers to mankind an emphasis on the importance of the individual, the belief of the Brotherhood of Man under the Fatherhood of God the concept of the dignity of work and its necessity for the pursuit of happiness, the opportunity to realize one’s social aspirations in a morally constructive way, and a philosophy of life which can lead to individual, and therefore community happiness. This is why the third millennium really needs what Freemasonry has to offer. You may become as active as you wish in your local body, but memorization of a catechism is not required. Whether you possess ritualistic skills, or are anxious to become involved in arranging community events, or preparing refreshments after a meeting, there is always something you can do to further the ideals of Masonry through the York Rite. Leadership opportunities often exist for those individuals wishing to expand their horizons in that direction. Opportunities also exist for energetic and dedicated individuals to become active at the state or national level as well. Initiation fees are established by each local body, but typically range between $75 and $125 (this includes the Chapter, Council and Commandery, although it is not necessary to belong to all of the organizations). Annual dues for each body are also established locally, but typically range between $30 and $50 per year for all three organizations. 2B1, ask 1. The only other things that are required are that: 1) you be a member in good standing in a lodge recognized by the Most Worshipful Grand Lodge of Ancient Free and Accepted Masons of the State of Illinois, and 2) pass a unanimous ballot of the members present. Brethren of all monotheistic faiths and denominations are welcome in the Chapter and Council, however, the Commandery of Knights Templar requires a belief in Christianity. It has often been said, “All Christian Masons should be Knights Templar”.